Sparta, TN (October 16, 2014)—Bluegrass and Country music legend, Lester Flatt, was honored in his hometown of Sparta, Tennessee recently when city and county officials joined forces to unveil an historical marker in his honor during Sparta's annual event, Liberty Square: A Lester Flatt Celebration. Plans for the marker began nearly 18 months ago when Sparta residents, Blake and Kimberly Williams presented the idea at a White County Commissioners meeting to have a marker placed at Oaklawn Cemetery where Flatt is buried. "Lester was a very humble man and when he passed away, he didn't want a lot of attention," explains Blake Williams, who is a former member of Flatt's band, the Nashville Grass, and was also a pallbearer at Flatt's funeral. "Kimberly and I have talked to many people who worked with Lester over the years and also to his family, and we've all felt the same way—that we wanted to do something in his honor. Since he would have been 100 years old in June of this year, it just made since to do it now." The commissioners agreed and voted unanimously to pass the budget for the marker. Sparta's Mayor, Jeff Young, was at the meeting and without hesitation volunteered to pay for half the cost and offered any assistance needed to see the project through. "With the green light from both city and county officials in place, Kimberly began the legwork that involved working with the officials, tasking country music historian, Barry Mazor with the text for the marker and enlisting the help of W.D. Stone & Associates on a design." 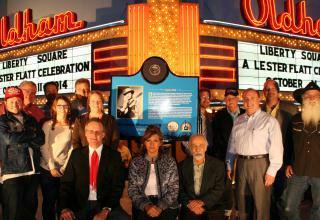 The historical marker was unveiled during the city's annual event, named for Flatt, on Saturday, October 11th. "We've been producing 'Liberty Square: A Lester Flatt Celebration' for well over a decade now and were thrilled to be able to commemorate Lester's 100 years in bluegrass with this marker and some very special guests," states Sparta Mayor, Jeff Young. The 45-minute ceremony included a special music presentation by Blake Williams who enlisted the help of another Nashville Grass alumni, Roland White, as well as Michael Cleveland, Wayne Southards, Dwayne Anderson and guest appearance by Darin Aldridge. Tennessee State Representative Paul Bailey presented a proclamation on behalf of the State of Tennessee honoring Flatt's contributions to bluegrass and country music and Kyle Cantrell, former Grand Ole Opry announcer and current program director for SiriusXM Bluegrass Junction, spoke on Flatt's impact on him personally and professionally. In attendance and recognized during the ceremony were Flatt's granddaughter Tammy Brumfield and her husband Mike; Don Clark, owner of the Bluegrass Bus Museum; Danny Clark, an International Bluegrass Music Association (IBMA) Board member; Joe Lurgio, IBMA staff member; Ashlee-Jean Trott, associate producer of Music City Roots; Ray Seckler representing his father Curly Seckler; and White County Executive Denny Wayne Robinson. The historical marker will be placed at Oaklawn Cemetery located on Hwy 70 just outside of Sparta, TN in the next few weeks.